I love the simplicity of regency dresses... especially white ones. I searched high and low for the right fabric to make my dress - a white sheer cotton. Surprisingly the only plain white sheer I could find was polyester or poly/cotton blend, which I was not about to use (polyester... *shudders*) Finally I stumbled on this swiss-dot at Hancock fabrics... and it was on sale! Needless to say, I was pleased - very pleased. :) The petticoat underneath is white linen. I'm also am going to make a peachy-orange petticoat, so it will lightly show through and I can have two dresses in one. We had a lovely location to shoot these photos. My dad took a vacation off work and we went up to northern Wisconsin to Door County. Dad's secretary's brother owns a beautiful "estate", 300 feet above the water, and he was so kind to let us stay there for our visit! Here's an up-close view of the back. You'll notice that it doesn't close in the back (the seam you see is the petticoat closure), and at first glance it doesn't look like it's possible to get into the dress, but the front of the bodice has a drawstring at the bottom, and hooks and eyes along the drawstring casing, so the front of the skirt hooks onto it. I wanted a somewhat invisible way to close it, and this seemed to be the easiest solution. I love pleats. Just saying. The whole house was stone, which made for some great settings. This spot was right above the 300 ft drop-off. The water was so blue and beautiful. Every day there were lots of sail-boats, as well as kayaks, speed-boats, canoes, jet-skis, and even a few para-sails! All photos copyright ©Kathryn Grace Photography. All rights reserved. I.WANT.ONE. You did a beautiful job! That house was just amazing!!! Too bad it's so far away; it's perfect for historical photos! Thanks for posing for me! Oh, how beautiful! You did an amazing job on the dress- I don't know how to sew, so I greatly admire people who can sew like that. 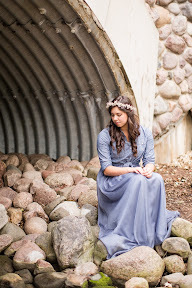 Beautiful photos, beautiful dress, and beautiful girl! ;) And of course, that estate is simply lovely! Esther - I know!! The view was incredible! It was even better in person! Thanks and say thanks to your dad for me! Samantha - Aw, thanks so much! Laura - I should rather like to show you the dress in person! Maybe we can convince Kathryn to do a photo-shoot of YOU in the dress! Regency tea party, here we come! Miss RJ - Thank you!! We really need to get together soon - it's been waaaay too long! Rory&Muffin a.k.a. Kristen - Thanks! :) Yes, Kathryn does take fantastic photos - here's to photographer-sisters!! Ella - Weeeellll.... I sort of made my own pattern. The back and sleeves are from Sense and Sensibility's "Elegant Ladies Closet" pattern, with some slight fitting changes. The front I made myself. The skirts are both from Sense and Sensibility's "Regency Gown" pattern (I used the one from Simplicity, but it's the same pattern). Hope that was helpful! I LOVE.LOVE.LOVE your dress! My idea of a dress like this would be a long-sleeved, square-neck, blue dress with lace at the neck and wrists. I can't tell you how excited I was to stumble across your blog! Elizabeth - Wow... thanks so much!! I always want to make a ton of dresses after watching Pride and Prejudice too! It's such a pretty and yet simple era! Hmmm... I think I worked on this dress off and on for a week I think. The under-dress I made in two days, if I remember right. amazing dress! I love it, Tara good work! so so pretty!! !